Bleu Mont Dairy’s bandaged cheddar cheese is an American treasure. There’s something about Bleu Mont Dairy’s bandaged cheddar cheese that makes people speak in hushed, dreamy tones. Gordon Edgar, cheese buyer at the Rainbow Grocery cooperative in San Francisco, feels similarly. “They vary batch by batch, so it’s hard to describe [Bleu Mont Dairy’s bandaged cheddar] overall, but I would say that recently, it’s had this incredible great balance of sweetness with earthiness—a caramel-sweet flavor and also a milky sweet flavor. You usually don’t have both at the same time. It’s an incredibly well-balanced and complex cheese,” he says. In America, “you grow up on Kraft singles and mild cheddar, and then you taste something like that,” and the difference is obvious, he says. All credit goes to Bleu Mont’s cheesemaker Willi Lehner. Lehner, 60, has been working with and around cheese since he was a child growing up in Wisconsin, where he helped out in the cheese factory his Swiss father managed. He later spent much of his 20s in Switzerland, where he learned firsthand about old-fashioned cheesemaking in the Alps. In the late 1980s, Lehner eventually made it back to Blue Mounds, Wisconsin, and started experimenting with his own recipes. Though cheddar cheese seems ubiquitous, especially here in the U.S., pinning down a simple definition isn’t an easy task, according to Edgar, who is also the author of Cheddar: A Journey to the Heart of America’s Most Iconic Cheese. Every cheesemaker will inevitably use techniques, practices, and tools unique to his own cheddar recipe that can vary wildly at every step of the process, and which all affect the final product. But there are some basics, Edgar says. You start with milk, heat it up, and add a starter bacterial culture to initiate fermentation. Then you add rennet, an enzyme that coagulates milk proteins to produce curds. The curds are cut to expel moisture and liquid (also known as whey), an essential step to ensure that a cheese won’t rot when it’s aging. The curds are also “scalded,” which entails heating them to just over 100 degrees Fahrenheit to expel more whey more evenly; the process makes cheddar a durable cheese, according to Edgar. The whey is then drained from the curds. The curds are next dropped into a mill that slices them into smaller chunks again, and salt is added. Then the cheese is pressed tightly into forms (the type of form used varies depending on the cheese and cheesemakers; Lehner lines his stainless steel forms with cheesecloth for his bandaged cheddar). And then the cheese is ready to be stored and aged. Bandaged cheddar, also known as clothbound cheddar, emerged in the 1700s and is an offshoot of an English cheese that’s been around since the 11th century, according to Edgar. The cheese gets its name from the way it was historically aged in cheesecloth, which helped protect it from insults such as mites or cracks. The method, which pre-dated more advanced wrapping materials like wax or plastics, also allowed for more complex flavor development as the cheeses aged. Lehner was inspired to make his own bandaged cheddar about 12 years ago, after sampling various cheddars from a Michigan-based delicatessen called Zingerman’s. “I thought, oh my god, this is on such another plane of what cheese is, or cheddar, anyway,” he says. He had made versions of bandaged cheddar as a kid with his father but none since, so he found a Wisconsin family business that specialized in making the cheese and worked with them to create his own special recipe. He has tweaked parts of his formula, reducing the salt, adding an adjunct bacterial culture that helps reduces gases and off-flavors during aging, and adjusting the temperatures of the cheese at different steps of the process. Some of that tweaking was done to accommodate the cheese for his distinctive aging environment: the underground cave he built on his land. Lehner is a nomadic cheesemaker; he doesn’t actually own any cows or cheesemaking machinery. 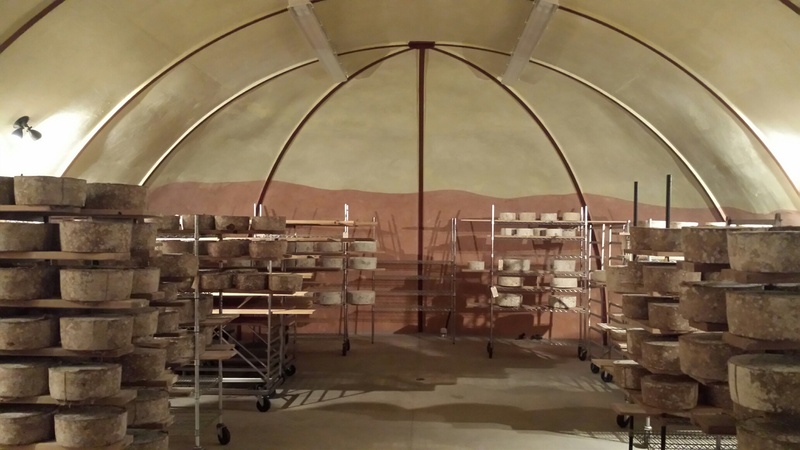 Instead, he works with local farms and uses their milks and facilities to make his cheeses using his recipes, and then brings his wheels back to his cave for aging. The cave, which takes up 1,600 square feet of his 16 acres of land, took a year to build. It’s 12 feet tall from the floor to the highest point in the ceiling, and is made of concrete. With rounded ceilings, it’s shaped like a tunnel, and could probably hold up to about 2,000 wheels of cheese at a time. Lehner wasn’t the first to build a cheese cave, but “he was a real pioneer in this,” showing others the kind of superior and complex products he could create in a specific setting that he could control, Edgar says. 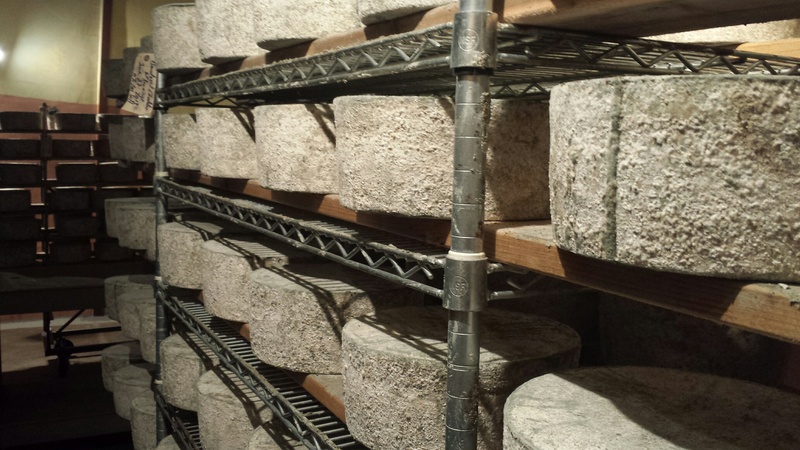 “He really learned what you need to do to build an aging environment for that specific cheese,” taking into account the space, temperature, and humidity. “When people saw what he was doing, he definitely influenced a lot of cheesemakers,” says Edgar. This mold, Lehner says, has microscopic roots called mycelium that grow into the cheese and release enzymes, which in turn give the cheese a lot of flavor. During the first month or so, he’ll turn the wheels of cheese every day or two to make sure the mold spreads evenly. “I’ve found it takes a good year before all the flavors start coming together and the mold and the enzymes start expressing themselves,” he says. Lehner will typically age his bandaged cheddars for a minimum of a year and up to 18 months. Bleu Mont Dairy produces about 12,000-15,000 pounds of bandaged cheddar a year. (In contrast, major cheese manufacturer Tillamook, based in Oregon, can produce 167,000 pounds of cheese in one day, according to one report.) An award-winner, it’s the cheese Lehner produces the most, and it’s the most popular. 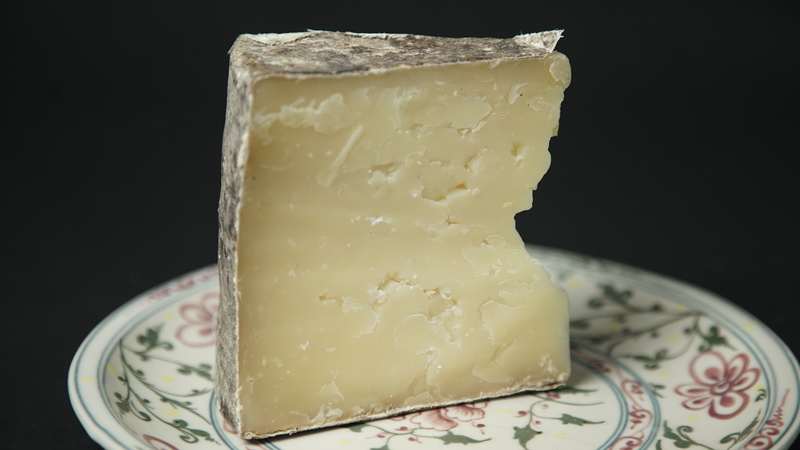 But Lehner’s other cheeses, like his Italian “Big Sky Grana” and his alpine-style “Alpine Renegade,” have also won awards and praise for their taste and inventiveness. A dairy scientist unwraps the history of processed cheese, and the simple chemistry that DIY chefs can use to make it at home.